Designed with traditional bridal elements--pearls, a cameo and classic coral colors--this bracelet is just right for adding a punch of color to your wedding ensemble. The pearl bracelet reflects your personality with its pretty, vintage-style cameo that doubles as a clasp. Full of color and class, this bracelet is ideal for wedding events that take place at a family home, boutique vineyard or historic venue. Change up this design style to create gifts for the mothers of the bride and groom, the maid of honor, bridesmaids and other special guests. 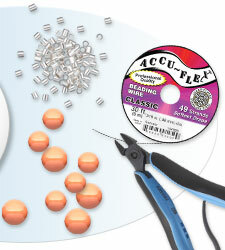 Using a pair of flush-cutters, cut (four) 10-inch strands of Accu-Flex® professional-quality beading wire clear .019 inch, 49-strand beading wire. Onto the first wire strand, string one crimp tube. Pass the wire through the first jumpring on the box portion of the clasp and back through the crimp tube leaving one end of the wire approximately 1-inch long. Pull the crimp tight against the jumpring. Using a pair of crimping pliers, crimp the crimp tube. Using a pair of flush-cutters, trim the excess wire from the short end. Place a crimp cover over the crimped crimp bead, lining up the beading wire with the area, that when closed will become the hole in the crimp cover. Using the front portion of the crimp pliers, carefully close the crimp cover around the crimp bead. Make sure that both ends of the crimp cover meet and you do not see a gap in the crimp cover. 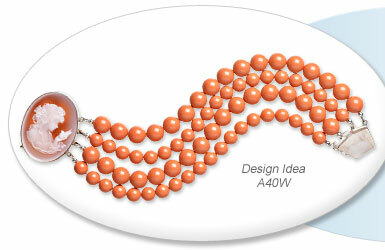 On this first wire strand, string (seventeen) 10mm Swarovski crystal coral pearls and then one crimp tube. Finish the strand by threading the wire through the jumpring on the cameo portion of the clasp, and back through the crimp tube. Pull the wire snug to secure beads onto wire before crimping. Trim excess wire. Place a crimp cover over the crimped crimp bead and close. Repeat the stringing process for the second strand with (twentyone) 8mm Swarovski crystal coral pearls, and on each end a crimp tube and crimp cover to cover the crimps. Repeat the stringing process for the third strand with (seventeen) 10mm Swarovski crystal coral pearls, and on each end a crimp tube and crimp cover to cover the crimps. Repeat the stringing process for the final strand with (twenty) 8mm Swarovski crystal coral pearls, and on each end a crimp tube and crimp cover to cover the crimps.